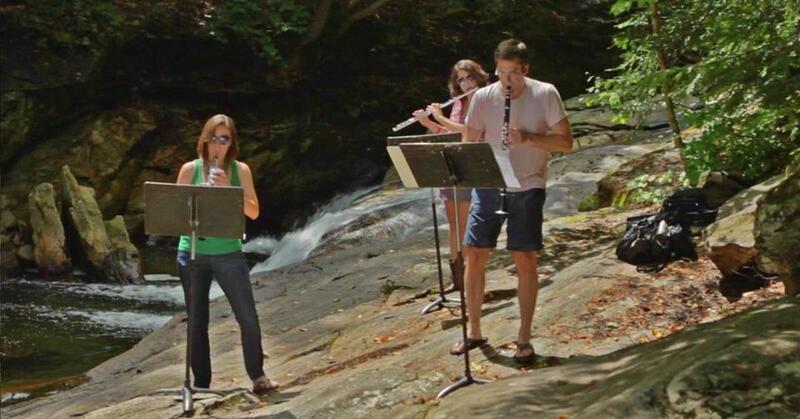 Pikes Falls Chamber Music Festival aids Irene recovery in Vt.
It’s rehearsal time near Pikes Falls on Ball Mountain Brook in southern Vermont. JAMAICA, Vt. — The Pikes Falls Chamber Music Festival (Aug. 1-9) celebrates the beauty and spirit of a small southern Vermont town hit hard by Hurricane Irene in August 2011. A backwoods swimming hole, Pikes Falls is the only dramatic drop along pristine Ball Mountain Brook. It was this normally shallow stream that, engorged by heavy rain, thundered down into the village of Jamaica, carrying away homes and bridges. “I had to contribute something to help and I think musically,” explains noted flutist Susanna Loewy, a second-generation summer resident who founded the festival three Augusts ago. Loewy remains responsible for its mixed programming and growing reputation. “These concerts are a real treat for music lovers who seek more than the old chestnuts,” says Elaine Beckwith, whose Jamaica village art gallery is a well-known destination for art lovers. The upcoming festival is an eclectic mix of traditional and contemporary works. The program includes music by Johannes Brahms arranged for a clarinet quintet, a piece by Maurice Ravel for flute, viola, and harp, and works by three composers-in-residence. The closing concert will climax with a “collaborative world premiere,” involving costumes and lighting by participating visual artists. All concerts are free, but donations are appreciated. The venue for three evening performances (Aug. 1, 6 and 9, 7 p.m.) and an Aug. 3 afternoon family concert is Jamaica’s red clapboard, tower-topped Town Hall, built in 1851 as a Universalist meetinghouse. A stage was added in the 1870s, and the hall became known for its acoustics. Recently renovated, it will be open daily throughout the festival as the musicians rehearse. Visitors are welcome, and artwork will be on display. Strung along Route 30/100, the West River Valley village of Jamaica is a brief but proud line of classic buildings that include the white Community Church (1801), the popular D&K Jamaica Grocery, and two welcoming vintage inns, Jamaica House Bed & Breakfast (Jamaicahouse.com) and Three Mountain Inn (threemountaininn.com). Signs point the way to neighboring Jamaica State Park, with its inviting swimming hole, hiking trails, and riverside camping. It’s the kind of village you drive through in a minute, but once you stop, may well stay far longer than planned. Scott and Helen Nearing came in 1932 and chronicled their stay in “Living the Good Life” (Schocken Books). It remains a back-to-the-earth bible. As Stratton ski area began to expand, the Nearings, who promoted simple living and self-subsistence, moved on, but vestiges of the community they spawned survive. In the Elaine Beckwith Gallery, you can leaf through “Almost Utopia,” picturing and describing “the residents and radicals of Pikes Falls, Vt.,” from around 1950. While memories of its countercultural communities have faded, those of Hurricane Irene remain all too fresh. Bridges have been rebuilt, but all the homes have not, and several shops have closed. In a town of 1,000 widely scattered residents, many of them part time, every departure — and arrival — counts. For festival details, visit www.pikesfallschambermusicfestival.com. Christina Tree can be reached at tree.christina@gmail.com. Correction: Due toa reporting error, an earlier version incorrectly spelled Susanna Loewy’s last name.